The SFSJ Catholic Worker House model works. That is verified in our outcome statistics. We know our staff is the reason that our guests stay committed. But how does our staff do it? How does our staff keep guests walking the talk and working what works? In mandatory weekly interviews, Karl and the other dedicated staff members ask each guest what he has done that week to get closer to the goals he himself created at his intake interview. Maintaining files that contain each man’s goals written in his own words is key. “We have weekly interviews to enforce the idea of progress. No man should remain in the exact same situation he was in the week before,” Karl explained. While interviews are not the only tool employed to encourage progress, they are a major factor in tracking a guest’s progress. As the normal 60-day stay for a guest nears its end, Karl has seen many guests rebel against doing chores or maintaining their required savings account. Karl can only guess that perhaps that man is acting on his fears that he really belongs back on the street. “We’re certainly going to be most tolerant when a guy is near the end of his stay. And we let him know he can and should stay connected with us. Independence can be a scary thing to someone in recovery,” Karl stated. How does our staff help guests to walk their talk and work what works? Our guests succeed because our staff members keep the issues of recovery and independence real. Bringing cooking skills, food and genuine concern to the evening meal is a specialty of the very generous men and women who volunteer at the House. As we have done in the past, we wish to thank them all and now introduce a few more. Sister Kay Tardiff, a Sister of Charity from the College of Mount St. Joseph, has recently volunteered to cook the evening meals on Mondays. Sister Kay is originally from Michigan where she ministered most of her time before retiring just recently. She formerly taught both elementary and secondary schools before moving on to hospital chaplaincy. And in an ecumenical agreement with the United Church of Christ in Bay City, Michigan, Sister Kay served as interim pastor during the church’s two year search for a leader. Come the last Tuesday of the month, we open the door for Jean Drach and Stan Thom, who invariably walk through carrying dinner. For the last year, this cooking team has faithfully traveled to Walnut Street to feed our guests. 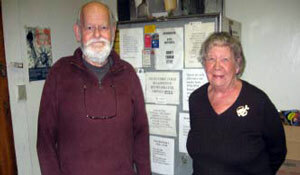 Jean and Stan shop and prepare a meal for 20 people, relieving our staff and our pantry of the responsibility. Our staff knows that this truly home cooked meal always ends with a specialty dessert and all look forward to it. Jean and Stan also have a connection with the College of Mt. St. Joseph. Jean, a retired mathematics professor, taught at the college for forty years. She is a world traveler who has visited many continents and countries. She has been a volunteer math tutor at Purcell-Marion High School. 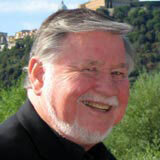 Stan, a retired foreign language teacher, taught French at the college, but then lived and taught abroad for many years, in Germany, France, Turkey, and Egypt. He is an accomplished woodworker and a docent at the Cincinnati Art Museum. Both Jean and Stan are great cooks and raconteurs. George Freudenberg another recent volunteer is a man up for anything. George has assisted the house in everything from meal preparation to chores to paperwork. A man of generous spirit, George can be relied on to finish any job we need done. With a grateful heart, we ask the Lord to bless all our dedicated volunteers and we welcome all who may step up in the future. 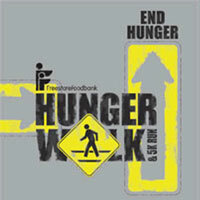 Please join our SFSJ House supporters as we walk again to raise awareness and funds to end hunger in our city. It’s a fun a rewarding morning for all. Memorial Day, May 25, 9 a.m. Learn more at the Freestore website where you can choose SFSJ Catholic Worker House as your designated charity. Can’t make the walk? Consider a direct donation to the House at PO Box 14274, Cincinnati OH 45240. 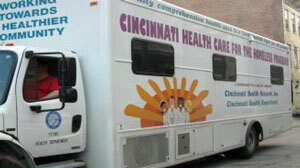 The Cincinnati Health Network, under the direction of Ms. Kate Bennett, brings the Healthcare Van for the Homeless to our doorstep every Monday evening. This much needed and appreciated service is staffed by the University of Cincinnati Family Physicians and other healthcare professionals. 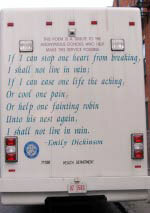 The van services the general healthcare needs of the homeless including flu shots, TB testing and pre-employment physicals. Funding is from both government and private sources. 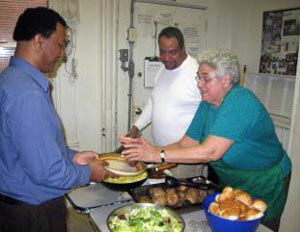 We thank those donors and professionals who make this valuable service available to the Catholic Worker House guests. Motivational thoughts are posted each Friday on our bulletin boards to inspire our guests, staff and visitors. We share these thoughts here and welcome your emails as you reflect on them. The opposite of faith is fear. Humble thyself, or life will do it for you. A wise man is wise before the event, not after. To look as if we are changing and to actually change are two different things. If we don’t change our direction we’re likely to end up where we’re headed. After 7 years as a conscientious employee, the job cut still came for House guest Alton Harris in late 2007. Company consolidation eliminated Alton’s truck driving career and began his new work of “just getting by”. With no immediate job in sight, Alton collected unemployment and lived off of his savings in an economy over his means. But Alton never gave up hope and did land another job at Kroger. 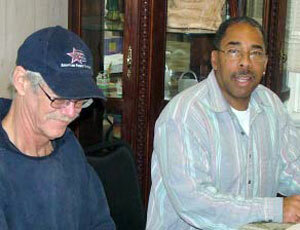 To stretch his wages, Alton sold his furniture and combined his resources with a friend, a roommate. But this too came to an end when Alton was asked to leave after a few months. Although he was now homeless, Alton managed to keep his job and slept in his car for over 2 months until the engine gave out. At that point, it became virtually impossible for Alton to get to his job. He was able to leave Kroger in good standing. Alton entered the House on January 29, 2009 after being homeless for about 6 months. Since Alton has been with us, he has faithfully gone out Mondays through Fridays by 4:00 a.m. seeking day labor work. Unfortunately, Alton has only gotten work 4 days in the last 22 days. At 53 years old, perhaps Alton’s age is working against him; it’s certainly not been for lack of trying. But Alton is not about making excuses. He knows that his 60 day stay here at the House is soon ending. With savings at a minimum, Alton is relying on his strong faith in the Lord to guide him and is returning to the Milford area where the local St. Vincent de Paul Conference has offered aid. Alton now hopes to return to his job at Kroger. Alton wants everyone to know just how good the Catholic Worker House was to him. He is grateful for the experience, he says. We ask everyone to keep Alton in their prayers. Father Mark Schmieder wishes to thank everyone for their prayers and good wishes extended during his recent hospital stay. Fr. Mark will now undergo radiation and chemotherapy as a precautionary follow up to his successful surgery. He asks that we continue to keep him in our prayers. Pillows, towels, wash cloths, salt, pepper, spices, ketchup, hot sauce, mustard, pickles and paper towels.